The Choice-based Credit System (CBCS) is fast gaining a place in various institutions across India’s educational landscape. The University has approved the implementation of the CBCS, ending confusion among the candidates seeking for undergraduate programmes. Nidhi Sharma of Elets News Network (ENN) gets the view of the educationists on the pros and cons of the system. The Indian Government recently made the Choice-based Credit System (CBCS) mandatory for all 400 public universities at the undergraduate and postgraduate level beginning in the academic year 2015-2016. After much debate and deliberations Delhi University approved the implementation of the CBCS from the upcoming session, ending the confusion among the students seeking admission to undergraduate courses. CBCS, which is practiced in many of the world’s acclaimed universities, has received mixed reactions in India from various educationists across the country. Many claim that CBCS aspires to help India meet international standards in the world which today is a global village. On the other hand, the introduction of CBCS by few top government universities, such as the Delhi University (DU), is being vehemently opposed by various bodies, educationists and teachers. In fact, DU’s programme to implement the CBCS has gone through very tough times. Initially, DU had decided to go ahead with the introduction of CBCS from the coming academic session, apparently without the ‘mandate’ of the varsity’s Executive Council. In an official communication to deans of all faculties on April 29, DU’s Joint Registrar (academics) directed them to start preparations for the implementation of CBCS. The registrar’s communication came after a meeting between the Vice- Chancellor, Dinesh Singh, and the deans to discuss its implementation on 23rd April, 2015. Strict opposition followed by the staff associations of over 30 DU colleges who resolved against CBCS for a range of reasons. 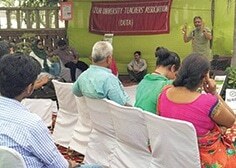 The Delhi University Teachers’ Association (DUTA) forwarded their resolutions to the University Grants Commission (UGC) that had posted the proposed structure and draft syllabi of 18 subjects on its website inviting comments. 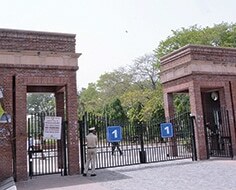 The UGC had advised the varsity to wait before putting the system into practice. Following this, DU said that in case the Executive Council decides against it, it would drop the idea. Presently, DU’s Executive Council has approved the implementation of the CBCS from the upcoming session, ending confusion among candidates seeking admission to the undergraduate programmes, but things are not as simple. Major opposition still stands tall, severely criticising DU for this. Sources have informed Elets Technomedia that the council comprised 17 people, of which five were not in favour of CBCS being introduced. Narain further added, “UGC is not acting in a very responsible manner and again trying to push through a drastic change just before admissions are about to begin for the next academic session. The move is not very constitutional and ignores the fact that universities have been given the right to frame their own syllabi and curricula due to the mass population of students who come from all backgrounds. “The concept of common curriculum being propagated by the present government can’t be imposed. Where is the flexibility of choice provided? As far as the availability to choose from unique subject combinations is concerned, there is a serious derth of number of qualified teachers for the same. Regular and permanent appointments need to be made to ensure that teaching-learning is stable”, he adds. Opining that we can’t only be experimenting with the future of students, Ghosh further said, “After all, what happened in the case of FYUP. Future of those students is still in a fix. The student count is rising exponentially while the infrastructure is not. In its financial budget, the government has reduced the allocation for education and this is a big setback. Many years back, Madan Mohan Malviya had said that if we want our country to rise in the next 30-40 years, we need to allocate at least 6 per cent of our total budget to education. The opinion of students is no different from that of their teachers. Mohammed Asif, a 2nd-year student of Aurobindo College, History Hons says, “Both CBCS and FYUP have common problems, completely ignoring the infrastructure capability of the University.” He threw further light on the problem of availability of experienced teachers, informing that there are 4,500 adhoc teachers in the university. “Furthermore, the syllabi of CBCS has not been prepared by the educationists of DU, but it is a bureaucratic syllabus. This is not desirable in education,” he said. 2. Elective course consisting of courses with 4, 3 or 2 credits and a student will have a choice of choosing any subject from any faculty other than his own subject. For example a student studying BA with HEP major can choose a course in literature, Music, Fine arts, Statistics and Environmental science, and computer applications etc. This gives expanded scope, enabling an exposure to other discipline. It adds to student’s skill. 3. Foundation courses which are of two kinds – compulsory Foundation or Elective Foundation. These courses are aimed at knowledge enhancement and value based education. Each semester will have about six courses with about 20 credits. For example four hours of teacher student contact hours in theory class room per week is considered as four credit course. If it is two hour student teacher class contact then it is equivalent to two credits. If it is lab teaching then four hours lab is equal to two credits, likewise. As the UG course is of three year duration with six semesters then if each semester is 20 credit, a student will study UG course for a total of 120 credits (6 semester x 20 credits each = 120 credits). But the total credit study can vary from 90 to 120 credits depending on the university system. The credits are converted into grade, grade points and credit points. Based on this, calculations are made to derive SGPA (Semester Grade Point Average) and CGPA (Cumulative Grade Point Average). In CBCS system a student can choose to conduct a research project also for one or two semesters (4 or 8 credits). It is also possible that a student can go to other university in India or abroad and study there and earn some credits for a semester period and come back to his parent university. The credits earned abroad or other university will be considered by his parent university. This flexibility of moving a student laterally and vertically in CBCS system is really a novel idea and convenient for students. To implement the CBCS at UG level, very massive office automation, classroom teaching using ICT facilities, MOOCs, Wi-Fi facility, Virtual classrooms and library facilities, automation of examination, transparency in evaluation, digital evaluation and digital printing of marks cards and degree certificates are essential with security features. 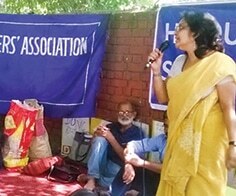 Furthermore, Jawaharlal Nehru University Students’ Union (JNUSU) came together with DUTA and other students to show their support against the CBCS. Ashutosh Kumar, President, JNUSU, holds the view that it is about the coming together of all bodies to unite against the undemocratic decision to introduce CBCS. This year, the Institute for International Education estimates that India is the number two country of origin for foreign students in the US, with over 1.2 lakh students studying there, contributing an estimated $3.3 billion. Therefore, a major percentage of the education fraternity decide on follow the internationally widespread CBCS. Under CBCS, students will be able to pursue three types of courses foundation, elective and core. Students must pursue core subjects every semester and are free to pick electives from a pool of subjects unrelated to their disciplines. This means if you are a computer science student, you can still opt for history as an elective. A study of varied subjects widens students’ horizon and exposure. The current framework suggests allotting 50 per cent of the total credits to core subjects, 25 per cent to applied core subjects, 20 per cent to interdisciplinary subjects and five per cent for foundation courses. With this interdisciplinary approach, students can choose to develop different skills like communication, writing and debating through their electives and emerge as more employable individuals. In this backdrop, where there are huge contradictions in views and perceptions are different, we need to understand that a particular system can have different implications in different situations and institutions. Maybe there can be a further exercise and better collaboration between the authorities involved, those implementing CBCS, and the students, whose future is at stake to come together and see what can be done to make a system successful and do away with its lacunae and problems.